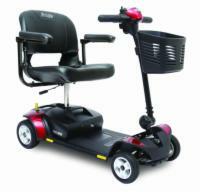 If you are a mobility scooter user, then you know how difficult it can be to traverse even a single step without the benefit of a quality scooter ramp. At All Electric Scooters, we have a wide selection of ramps that allow you to use your mobility scooter or power wheelchair at home or to make your business ADA-compliant. Modular all aluminum ramp system, for both home access and commercial use. Call 1-800-462-5458 for expert advice and pricing. These three section, manually operated van ramps, designed by PVI, are the perfect solution for those people needing a reliable, affordable van ramp. 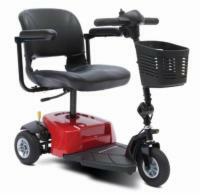 The solid full-width design accommodates scooters and wheelchairs and is ideal for temporary or permanent indoor/outdoor use for both home and commercial access. Suitcase Ramps are designed for scooters and wheelchairs users. They fold down to be carried like a suitcase. Extremely portable and easy to use. Threshold ramps allow your electric scooter or wheelchair to easily roll over uneven thresholds. Very inexpensive yet indispensable! Trifold ramps are our most popular models. Designed for scooters and wheelchairs, these unique ramps have a 3-fold design that provides compact storage and portability.